Here you can view tyre prices and sizes available to purchase and fit at our garage. We are authorized dealers for Blacklion Tyres, a perfect tyre for the Irish weather, with a tread design specifically designed to disperse water (see video at the bottom of this page). 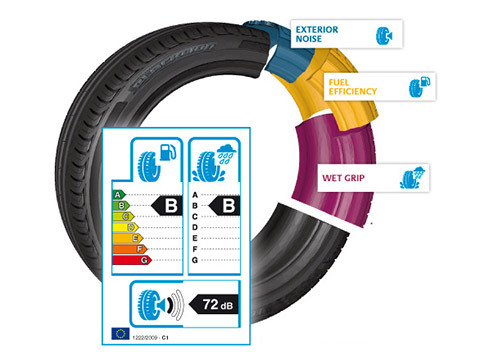 Blacklion tyres have low noise level, excellent wet grip, high fuel efficiency rankings and a low price tag! Passing by our premises? Call in and let us help you select the right tyres for your car, van, 4x4 or commercial vehicle, and have your new tyres fitted on the spot. No appointment necessary! 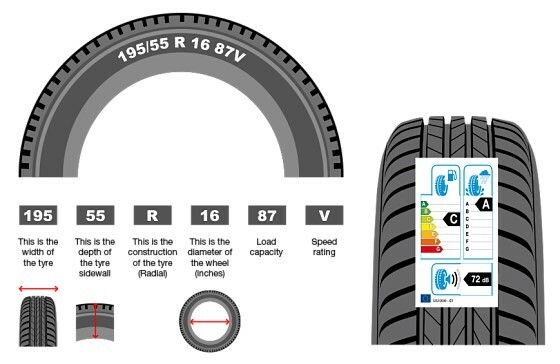 Check the *fuel efficiency rating when you buy your tyres. As pictured in the image, an “A” rated tyre would save you 6 liters of fuel over 1005 Kilometers (625 Miles) when compared with a “G” rated tyre. *Our price list table gives you the tyre fuel efficiency rating. 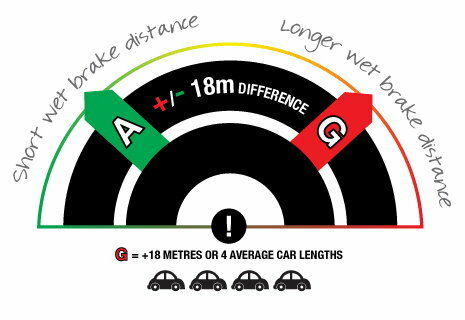 *Grip rating is a very important factor to consider when buying tyres. As pictured in the image below, the difference between an “A” rating an “G” rating can be 18 meters (683 Yards). Thats 4 average car lengths!! *Our price list table gives you the tyre grip rating. 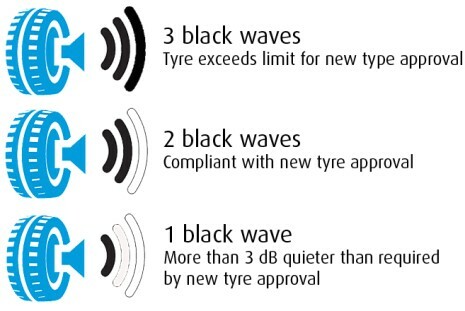 Check the label when you buying a tyre and get a tyre that has no more than 2 black waves, to be compliant with the new tyre approval. Our price list table gives you the tyre noise level rating.